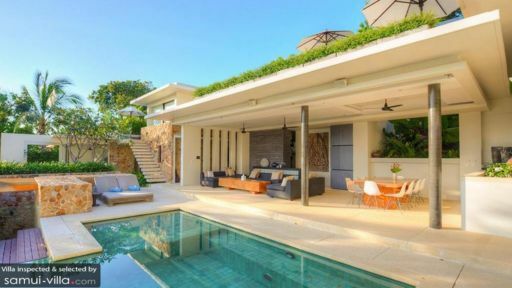 Villa Sip Hohk is a two-storey vacation residence that displays avant-garde architecture and contemporary Asian design. With a consistent warm and woody color combination, areas are accoutered with beautifully crafted appointments accompanied by first class accommodations – to assure you of absolute comfort and diversion. 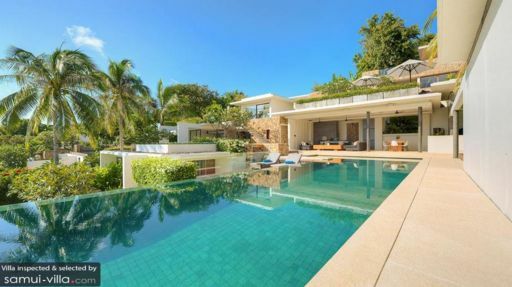 Built on a hillside above Choeng Mon Beach, Villa Sip Hohk accords you classy vacation living with a cool highland air. Two of the villa’s four sleeping quarters are master bedrooms. The other two sleeping quarters are guest rooms. All bedrooms have king-sized beds, dedicated bathrooms with indoor rain showers, private gardens and terraces with amazing bay views. One of the master bedrooms opens out to its own jacuzzi. The other master bedroom opens out right at the edge of the infinity pool. The two master bathrooms also have open-air rain showers and free-standing bathtubs. Extending toward the blue horizon is the villa’s 15-meter, alluring infinity poolwhich doubles as an aquatic balcony where you can gaze out – entranced – to the bay. On the wooden as well as stone decks of the villa’s multi-level exterior are pool beds where you can lay back in the sun or under the shade cast by tall tropical foliage. Close to the swimming pool is the airy common space – equally divided between the living and dining areas. Behind one of the living area’s couches is the modern kitchen. In a wing adjacent to the common space are the billiards and cinema rooms. Beside one of the master bedrooms is an office or study and up on the roof is a view deck with 360-degree vistas of both land and sea. Directed by a manager, the villa’s affable staff addresses the basic services like airport transfers, daily breakfast, housekeeping, pool maintenance, gardening and security. The staff can also arrange added services such as day tours, babysitting, personal catering, laundry and pampering regimens. Although these services will be charged to your account. Easily accessible from the villa is Choeng Mon Beach where there’s swimming, snorkeling and aqua sports – all to your heart’s content. But the enjoyment doesn’t end even as the water level recedes because you can now amble on to nearby Koh Fan Noir. Take advantage, as well, of the Walking Street’s Night Market held only every Wednesday displaying an array of affordable finds and novelties.